Not a particularly busy week, with just 3 movies seen, so I should have time to do a quick review of each of them. First up, we have the moderately entertaining anthology horror picture Trick 'r Treat. Set during Halloween in a small town in Ohio, we follow a series of interconnected stories involving such horror staples as werewolves, vampires, serial killers and ghosts. Despite the appearance of a number of fairly big name actors (Brian Cox, Anna Paquin and Dylan Baker), I had a few complaints with this one. My biggest gripe would have to be the tone of the movie - there is humour on offer here, but it's pretty crude and seems to be aimed at middle schoolers. However, this type of humour doesn't really gel with the sporadic outbursts of gory violence. For all of the blood and guts on display, it's never particularly scary. 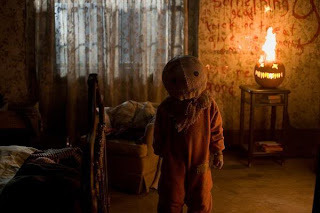 I suppose I just caught this movie at the wrong time of year - if I'd actually been watching it on Halloween night, I might have found myself getting into the spirit of it a bit more, but as it was, I felt decidedly unimpressed. No treat for you. 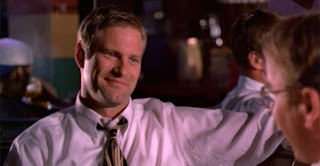 Second up, we have my pick of the week - Neil LaBute's debut picture, In the Company of Men. This was one of a number of films which I've found as a result of reading the AV Club's informative (and sadly, now discontinued) feature, The New Cult Canon. It's a nasty, cynical but very sharply scripted movie, in which two unpleasant executives decide to toy with the affections of a blind woman, just for sport. 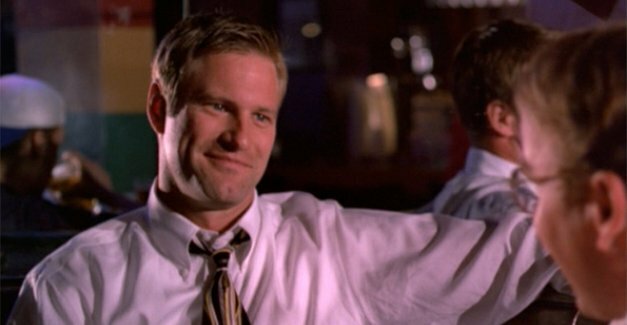 The movie is worth seeing just for Aaron Eckhart's terrific central performance as the instigator of the plot, an alpha male who uses his superficial charm and gift of the gab to destroy the lives of those around him. He's a memorable and unrepentantly vicious villain, two faced and without a shred of compassion. Finally, we have The Angels' Share, which was written and directed by the prolific British filmmaker Ken Loach. It's a story set in various depressed areas of Glasgow, with the protagonist a troubled young man named Robbie. As we enter the story, he narrowly avoids a prison sentence for his part in a brawl, and is warned by the judge that any further infractions will see him go behind bars for a lengthy stretch. As he has just become a father for the first time, he's desperate to avoid that fate - but with a number of enemies out looking for him, it won't be easy to avoid resorting to violence. He sees his potential financial salvation in stealing from a near-priceless cask of whiskey, but pulling the heist off won't be easy... Despite the serious social themes which run through the film, Loach keeps things surprisingly light-hearted and amusing, and it's obvious he has a lot of affection for his cast of Glaswegian characters. I was never completely blown away by this one, but it provides for a diverting hour and a half. Donald Kaufman: OK, I'm sorry, I never saw it."